OBJECTIVE: To assess whether active and passive smokers are more likely than non-smokers to develop clinically relevant glucose intolerance or diabetes. DESIGN: Coronary artery risk development in young adults (CARDIA) is a prospective cohort study begun in 1985-6 with 15 years of follow-up. USA. PARTICIPANTS: Black and white men and women aged 18-30 years with no glucose intolerance at baseline, including 1386 current smokers, 621 previous smokers, 1452 never smokers with reported exposure to secondhand smoke (validated by serum cotinine concentrations 1-15 ng/ml), and 1113 never smokers with no exposure to secondhand smoke. MAIN OUTCOME MEASURE: Time to development of glucose intolerance (glucose > or = 100 mg/dl or taking antidiabetic drugs) during 15 years of follow-up. RESULTS: Median age at baseline was 25, 55% of participants were women, and 50% were African-American. During follow-up, 16.7% of participants developed glucose intolerance. A graded association existed between smoking exposure and the development of glucose intolerance. The 15 year incidence of glucose intolerance was highest among smokers (21.8%), followed by never smokers with passive smoke exposure (17.2%), and then previous smokers (14.4%); it was lowest for never smokers with no passive smoke exposure (11.5%). Current smokers (hazard ratio 1.65, 95% confidence interval 1.27 to 2.13) and never smokers with passive smoke exposure (1.35, 1.06 to 1.71) remained at higher risk than never smokers without passive smoke exposure after adjustment for multiple baseline sociodemographic, biological, and behavioural factors, but risk in previous smokers was similar to that in never smokers without passive smoke exposure. 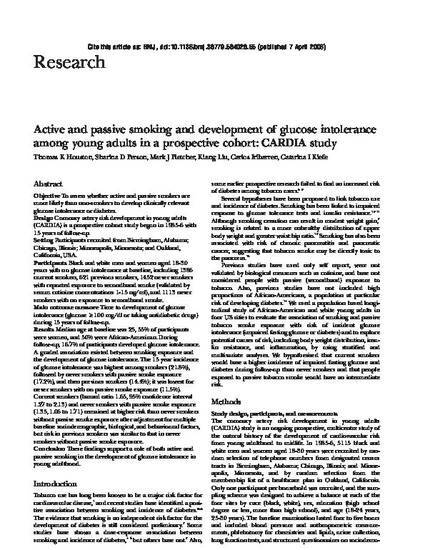 CONCLUSION: These findings support a role of both active and passive smoking in the development of glucose intolerance in young adulthood.